An aquarium just isn’t complete without gravel. You want to find something that’s perfect for plants, there’s a gravel out there that will meet your needs. Aquarium gravel is available in all shapes, sizes, and colors and sets to mood for your tank. Here’s everything you need to know about aquarium gravel and the best options available. 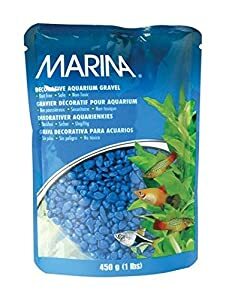 What is the best gravel for aquarium plants? How deep does aquarium gravel need to be? How to clean aquarium gravel? There are a lot of reasons why you should use gravel in an aquarium. The first is that it just makes it look better. Whether you go with natural stone for an authentic look or a bright color that makes the whole thing pop, your tank will look better with gravel on the bottom. Gravel serves a few important functions, too. First, it’s the perfect way to anchor any aquarium plants you’re adding to your tank. In the right conditions, your plants will root and thrive when placed in gravel. Gravel also acts as a home for the bacterial colonies that your tank needs to stay healthy. Plus, if you get gravel that is small and compact enough, there’s less space for detritus to hide, which keeps your tank clean and the water balanced. If you remember that gravel is for more than just making your tank look good, you’ll be able to see why some is better than others. Here’s a great place to start if you’re looking for the best color gravel for your aquarium plants. 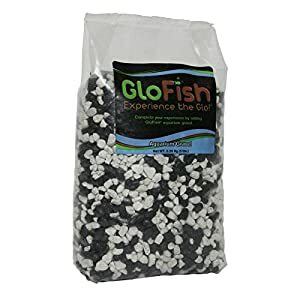 One really great choice for aquarium gravel comes from GloFish. It makes a great home for any water plant plus it really adds a pop of color to your tank. You can use this is a GloFish aquarium to get the full blue light, glowing effect but it looks great in any tank. It comes in a range of colors, everything from simple colors like solid white and black to bright neon pinks, greens, and blues. There are some multicolor options available, too, but keep in mind that single color bags contain smaller pebbles and are more uniform in shape and size. This gravel is made so that it doesn’t change the pH of the water, which will help keep your fish happy and healthy. This decorative gravel from Marina looks amazing. It’s available in 6 different colors: black, blue, burgundy, orange, and purple, and neon yellow. It’s a great way to add some personality to your tank. Choose a color that makes your fish stand out. What’s the point in having a beautiful fish if you can’t show it off? Plus, it’s the perfect size and shape for anchoring the roots of aquarium plants or to hold other decorations in place. This gravel is coated in epoxy so it won’t have any effect on the chemistry of your tank. That makes it a little easier to make sure everything stays balanced. The epoxy also serves as the perfect place for beneficial bacteria colonies to grow, a necessary addition to keep any fish tank healthy. If you’re looking for something more natural, check out this pebble gravel from Spectrastone. This gravel is made from natural rocks and is called “pebble gravel” because it’s so small. The size of the pebbles isn’t uniform, which makes sense since rocks in nature aren’t all the same size. Each pebble in this mix ranges from ¼ to ½ inch in diameter. It’s great for anchoring plants, holding down decorations, and just making your tank look authentic. The non-toxic coating prevent the pebbles from affecting the chemistry of the water and gives beneficial bacteria a place to colonize. Carib Sea makes a gorgeous natural gravel that’s really safe for the water. With no paints or dyes, it really helps your tank look and feel like a real river bed. This product is made in the USA and has a neutral pH that won’t change the delicate chemical balance in the water. One of the best things about this gravel is that it’s so small. When you put it in your tank, there isn’t much space between the pebbles which means less space for waste to hide. Plus, it’s the perfect texture for anchoring water plants and decorations in your tank. Blue is a popular color for aquarium gravel, but Imagitarium takes it to the next level with this Blue Jean Gravel. It isn’t just blue. It’s a blend of different shades and tones of blue that really give your tank a unique and fun look. But it’s more than good-looking, it helps keep the environment in your tank just right by providing a healthy place for beneficial bacteria to grow. It also helps keep down the amount of waste in the water. 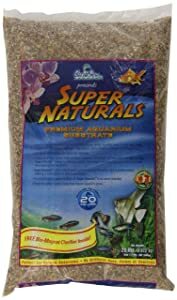 This gravel is completely non-toxic and is safe for freshwater and saltwater tanks. 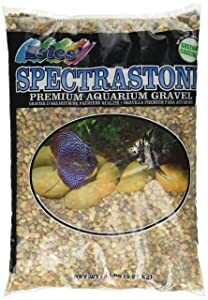 Spectrastone Shallow Creek Regular is our pick for best gravel for aquarium plants. It’s made of natural rocks so it just looks great in general, but what really makes the biggest difference is the shape. These pebbles vary in size, just as they would in nature, and fit together in such a way that they’re the perfect place for plants to root. Plus, the non-toxic coating prevents them from changing the water chemistry while giving good bacteria a place to grow. A good rule of thumb when shopping for aquarium gravel is to use 1 ½ to 2 pounds of gravel for every gallon. This will vary slightly with the shape of your tank and the size of the gravel but it’s a good place to start. It’s good to have an idea of how much you should buy when shopping. Having about 2 inches of gravel on the bottom of your tank is ideal if you have one that’s under 50 gallons. This is a good height that keeps the proportion of water and gravel looking natural and gives your decorations a nice base to sit on. Plus, it’s a great depth for plants to root. If you have a larger tank, say, 50 gallons or more, you can go up to 3 to 4 inches. Again, this keeps the proportion of gravel to water in the tank aesthetically pleasing. Plus, you might want larger plants in a larger tank. Deeper substrate gives them more space to root so that they can reach their full potential. If you choose to use an undergravel filter, 2 inches is usually the minimum amount you’ll need but make sure you check the manual to be sure. Now, do you really “need” 2 inches of gravel? Not if you don’t have any live plants in your tank. If you like less gravel, a thin layer is fine. Try not to go too thick, though. Too much gravel gives waste and dirt too many places to hide and could throw off the balance of the whole tank. Believe it or not, cleaning aquarium gravel is a bit of a process. A lot of steps have to be taken to maintain the proper balance in the water so you don’t completely change the environment with every cleaning. The most important thing to remember when cleaning gravel is this: you have to use some dirty water from the tank. Think about it like this. The tank is its own little ecosystem. There are a lot of things going on that keep everything in balance. Introducing the gravel to the tank after it’s been washed with new, clean water can be too much of a shock to the environment. Use a mix of half tank water, half clean water. Put your fish in a bucket with tank water. Then, unplug the filter, lights, and any other electrical equipment. Drain the tank and put aside some of the dirty gravel. You do this for the same reason you mix clean and tank water when you clean. Bacterial colonies take time to grow and if you don’t set some aside, you’ll lose everything that was already working in your tank. The colonies that are living on the dirty gravel can grow and expand more quickly to recolonize the tank much faster than starting from scratch. Next, put all the gravel in a bucket. You can use 2 if you have too much gravel. Don’t fill it up to the top, only go as high as ¾ of the way because you need room to move it around without it spilling out of the bucket. Then, use your sink, tub, or a garden hose to fill the bucket until the gravel is covered. Shake and stir the gravel in the water to get it clean. Don’t use soap as it could hurt your tank when you put the gravel back in. Clean the sides of the tank and filter if needed. Then, put the gravel back into the tank, mixing the clean with the dirty. Fill the tank with tap water and add dechlorinating drops. Turn the filter, lights, etc back on. Don’t put the fish in right away, you have to wait until the temperature is right. That might mean waiting for it to return to room temperature or waiting for a heater to get it back to the right degree. Once the water is right, add your fish back in. There are a lot of reasons why gravel is such an important addition to any aquarium. It not only looks good, it actually helps keep the tank healthy. By providing plants a place to root and bacteria a place to colonize, gravel serves an important purpose. Another great thing about it is how much variety is available. You can find everything from neon gravel that glows under a blacklight to small pebbles that come from natural river rock to help you make the perfect home for your fish. Our top pick for best aquarium gravel is Spectrastone Shallow Creek regular gravel. It’s one of the most natural looking gravels we found and provides your tank with just the surface it needs to thrive. This was a really good starting point for me to learn about setting up my fish tank. Easy to read and understand. Avoid GloFish gravel. It chips and its painted rocks will spike Ammonia in your tank beyond control. I spent hundreds of dollars and couldn’t tell what was causing the Ammonia and my fish dying until I realized it was the colorful GloFish rocks. 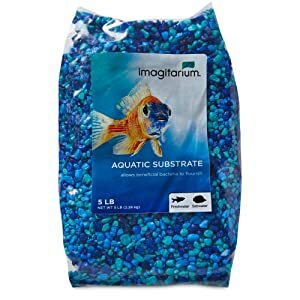 Is colored gravel of any rating safe for fish? What is epoxy?? ?